It’s common for those new to Improv to allow fear or lack of confidence to keep them from volunteering for games. When outcomes are unknown and collaborators’ actions unpredictable, stepping up to play an Improv game can feel like an excursion into the Bermuda Triangle. With no map, no recognizable landmarks, and many tales of odd experiences, it seems safer to stay put and avoid looking foolish, lost, or incompetent. Counter-intuitively, this illusion of safety through reticence is precisely that…an illusion. It’s actually safer to step into the fear by volunteering. The very act of acknowledging the fear and going toward, rather than away, from it often renders it impotent. Once up in front of the group, a player who does stumble or make an error during a game rarely is seen as foolish or inept. More likely, the audience will describe her as bold and action-oriented. Decide to respond to fear of failure as if it were an invitation to approach rather than as a warning to avoid something. Improvisers are taught that confidence to perform can effortlessly coexist with fear. They can’t know how any game will turn out, yet they trust that it will be all right. Mark Twain’s observation that “I’ve been afraid of many things in my life and most never happened,” is a helpful mantra to repeat whenever trepidation is felt. This approach allows you to stay highly involved in the process while remaining minimally attached to any particular outcome. The energy that you use to try and control the uncontrollable is as futile as trying to sculpt fog. By learning to let go of outcome, you can let go of the need to control the process. Once you’ve let go of the need to be in control, you often begin to feel more in control of that situation. The more you trust the process, the more you begin to trust yourself. This gives you both confidence to be in situations where you don’t know the outcome in advance and also the ability to act in those situations. 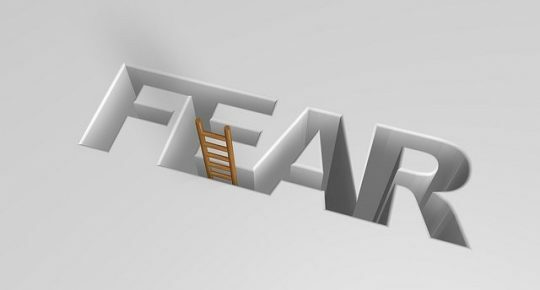 You begin to experience fear as merely another emotion in the broad range of life’s experiences. Just as you understand that you don’t need to let every angry, lustful or destructive feeling dictate your behavior, you appreciate that fear is an inducement to, rather than a mandate, for action. By abandoning the need to know specific outcomes in advance, you allow yourself to direct that energy towards maximum creativity. It’s not like working without a net. It’s like knowing that your net is always there, within you. Thanks for playing along! Stay well and mirthful.